Pyroclastic-fall deposits are produced by the gravitational fall and accumulation of fragmental material ejected by explosive eruptions. Tephra is a generic term referring to fragmental material of all size classes. 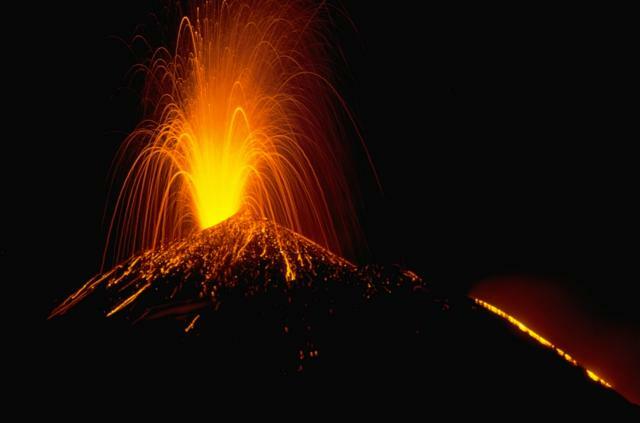 Explosive eruptions are one of Earth's most dramatic geological processes and have been the subject of the brush and pen for thousands of years. Eruptions can involve new magma (referred to as juvenile material) or the ejection of pre-existing rock and debris from around the vent. 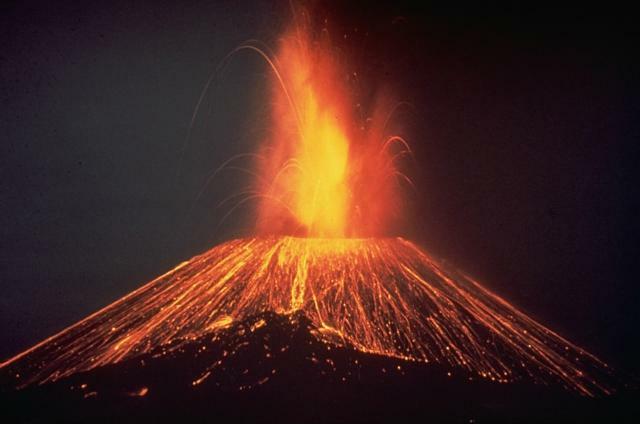 They can range from minor, relatively passive gas-and-ash emissions reaching only a hundred meters or so above the vent to powerful magmatic explosions that can eject large volumes of material and produce eruption columns that reach tens of kilometers above the volcano. Smaller eruptions eject material that accumulates near the vent, but large explosions inject ash and gases into Earth's stratosphere, where it can circle the planet and have major impact on global climate. Pyroclastic-fall deposits vary widely in particle size, but typically have a narrow range of particle sizes at a given location and become finer-grained away from the vent. They provide valuable time layers useful in unraveling the eruptive history of a volcano and a volcanic region. 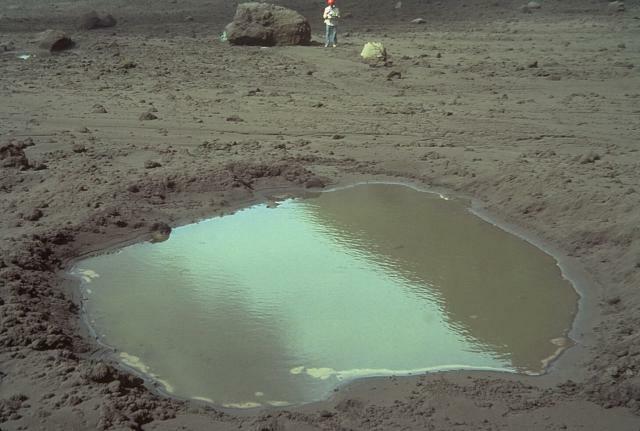 This 4-m-wide, water-filled impact crater was formed when the block in background, with volcanologist Ian Nairn providing scale, was ejected during a strombolian eruption from White Island in New Zealand in late March 1977. The block, composed of pre-existing wall rock of the crater, bounced, forming the impact crater, and then slid to its present location, 250 m from the source vent. Photo by Bruce Houghton, 1977 (Wairakei Research Center). 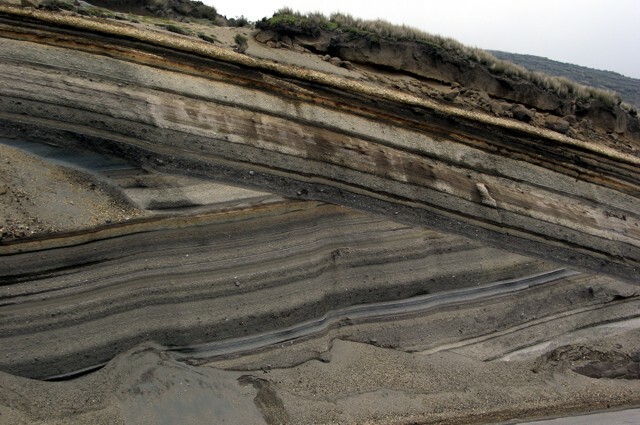 This classic outcrop at Oshima volcano, in the Izu Islands, south of Tokyo, shows more than 100 individual layers of pyroclastic-fall deposits. 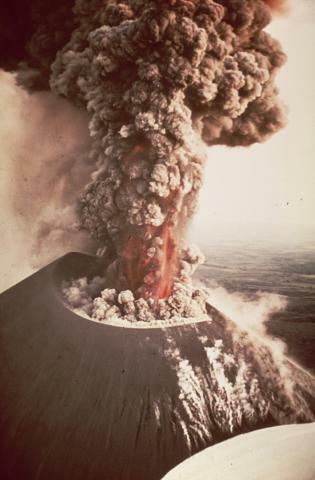 They were produced by eruptions of Oshima volcano at fairly regular intervals over a period of about 10,000 years. 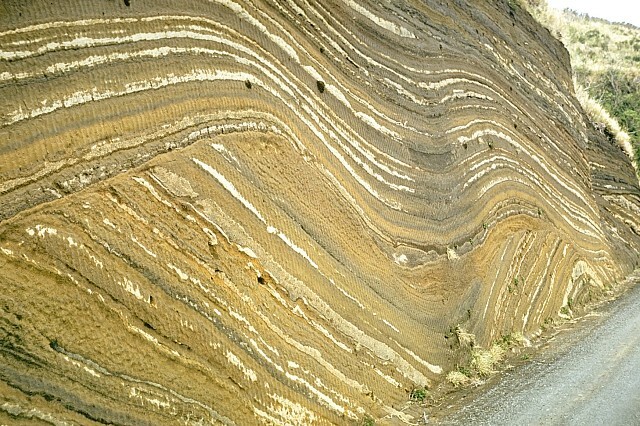 The dips of the tephra layers do not result from folding or faulting. The lower layers drape the sides of an old valley. A prominent unconformity in the center of the outcrop is an erosional surface that truncated deposits of the earlier eruptions. The upper layers mantled this uneven surface. Volcanologists from the Institute of Volcanic Geology and Geochemistry in Petropavlovsk and the New Mexico Institute of Mining and Technology excavate a section through layered pyroclastic-fall deposits from Ilyinsky volcano in southern Kamchatka. Detailed study of the products of individual eruptions are used to determine the timing, frequency, and magnitude of those eruptions. 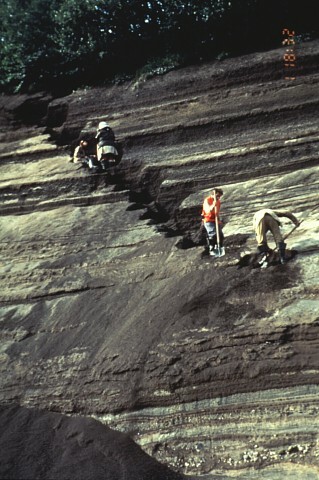 The sequence of tephra layers shown here was deposited by explosive eruptions from Ilyinsky during the last 5000 years. 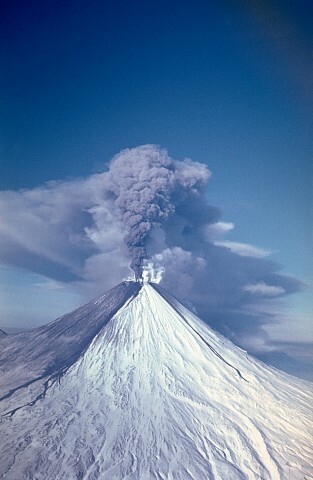 An ash plume ejected from the summit crater of Kamchatka's Kliuchevskoi volcano on February 9, 1987 is blown to the west. Ashfall from earlier eruptions darkens the southern flank of the volcano. 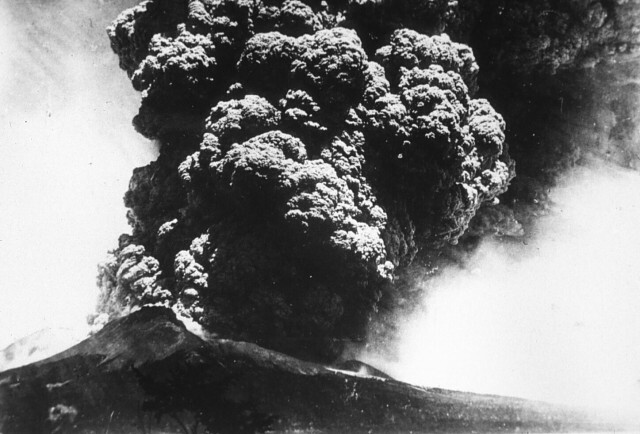 Explosive eruptions from the summit crater during 1986-1990 were accompanied by lava flows from both summit and flank vents. 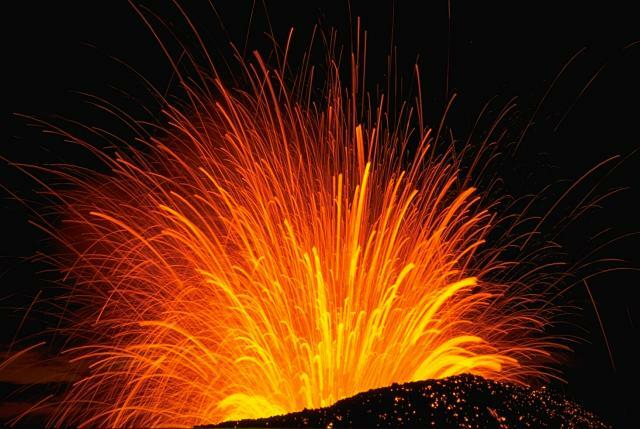 Strombolian eruptions at Pacaya volcano in Guatemala produce a colorful nighttime display. This November 1988 time exposure traces the incandescent parabolic arcs of individual volcanic bombs explosively ejected from the vent. Larger bombs remain incandescent after they hit the surface of the cone and roll down its flank. The orange line at the lower right is a lava flow that issued from a fissure on the upper NW flank of MacKenney cone. An erosional unconformity cutting diagonally across the center of the photo due to a glacial advance about 20,000-18,000 years ago separates two sequences of late-Pleistocene tephra layers from Ecuador's Chimborazo volcano. A less prominent unconformity below the light-colored tephra layer at the top of the sequence marks a 16,000-14,000 year old glacial advance. This ~12-m-thick exposure lies on the SW flank of Chimborazo, Ecuador's highest volcano. 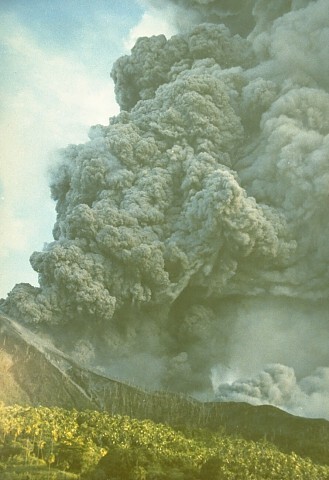 Four days after the start of an eruption from Lonquimay volcano on December 25, 1988, a vigorous ash column rises above a vent on the NE flank. Winds distribute the ash column to the SE. 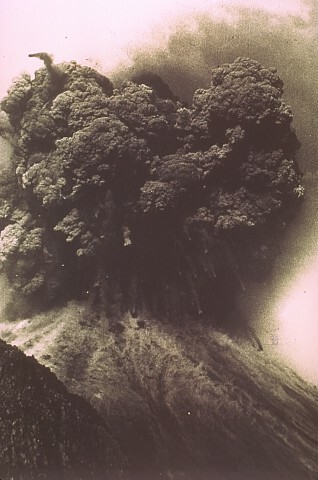 Heavy ashfall from the eruption, which lasted over a year, caused severe economic disruption. This east-looking view shows the ice-filled summit crater of Lonquimay at the lower left. The dark area extending to the left from the eruptive vent, which formed along a fissure system trending NE from the summit, is a lava flow that originated on December 27. Photo by Jeffrey Post, 1988 (Smithsonian Institution). 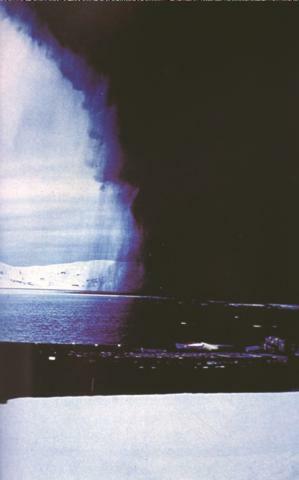 Ashfall darkens the sky above Antarctica's Deception Island in December 1967. 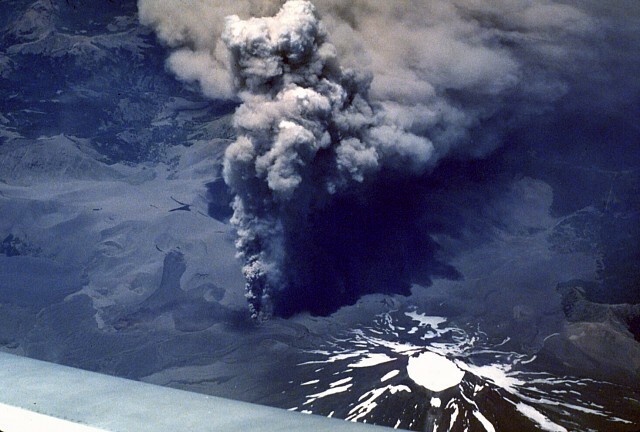 Falling ash can be seen trailing from the margins of the eruption cloud. Winds distributed the ashcloud to the NE and deposited 30 cm of ash 2 km across Port Foster caldera bay onto the Chilean Antarctic research station, where this photo was taken. Photo by Bernardo Blass, 1967 (published in González-Ferrán, 1995).